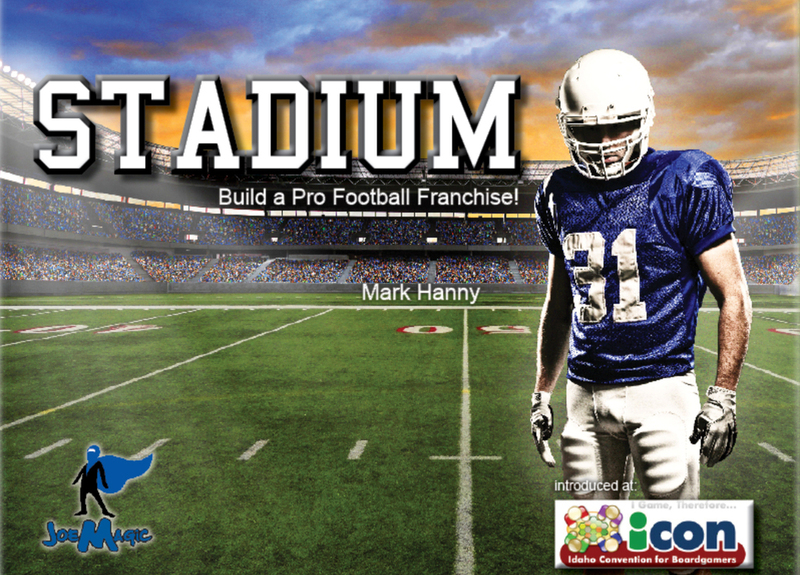 Stadium is a game by Mark Hanny, published by Joe Magic Games. It is for 2-5 players. In this game, players take on the role of owners of a multi-million dollar professional football team. They will be making lots of executive decisions like which players to draft, who to hire and what to build for their stadium. Each decision will be carried out by their Vice Presidents in an attempt to earn victory points. In the end, the player with the most victory points will be declared the winner. To begin, each player is given 3 million dollar tokens. They will then choose a color and are given the 7 blocks of that color, as well as the 2 corresponding vice presidents. The Action board is placed in the middle of the play area. The Stadium Building board is assembled and placed in the middle of the play area. A white bonus chip is placed on the spaces with the arrow symbols on them. The blue employee cards and green player cards are separated into 2 separate decks. Each deck is then shuffled and placed face down next to the boards. The tokens with victory points on them are placed next to the board along with two $5 million tokens in the draft area. The first player is chosen and is given the Commissioner pawn. Play now begins. The game is played over several rounds. Each round consists of 5 steps. In the first step, players will take turns placing one of their vice presidents on the action board, beginning with the commissioner. This continues until each player has placed all of their vice presidents. When a player places one of their vice presidents, they will place them on one of the colored spaces of the board, not in the center white spaces. If there is a bonus token on the space, the player gets a bonus. There are several different spaces that a player can place their vice presidents. The money symbol will give the player a million dollar token. The card symbol will allow the player to draw an employee card from the deck and place it face down in front of themself. They will then draw another card and place it face up next to the board in the draft area. The star symbol allows the player to activate a hired employee. Any spaces that show one of the types of tokens gives the player one of those tokens. Spaces with red tokens or stacked tokens receive added benefits that are noted in the rulebook. In the second step, players will place, turn over or stack turn tokens. What this means is that for any completely empty spaces where there no vice presidents and no turn tokens, that space receives a white side up turn token. For spaces that have no vice presidents and a white turn token, the player will flip the token over to the red side. For spaces with a red token and no vice presidents, another red token is stacked onto that space. For spaces with a vice president on them, the turn token is removed regardless of which color is on the space. It should be noted that players will be penalized for spaces with stacked tokens remaining on them. This penalty is based on which spaces have stacked tokens on them. In the third step, players will perform actions based on which spaces their vice presidents occupy. Beginning with the top left of the Action board and moving down to the bottom right, each player that has a vice president on that particular board space will be able to take the action based on the symbol in the middle of the space. There are 9 different spaces. There is a space for Upgrading Equipment that allows the player to gain 2 equipment tokens. There is a space for Player Training that allows the player to trade 2 equipment tokens for 1 win token. There is a space for Hiring Staff that allows the player to either hire a new vice president for 6 million dollar tokens or they may hire as many employees as they would like and can afford that are face down. The hired employee is then placed face up in front of the player. It should be noted that employeed with star effects on them allow the player to use the effect when they play a vice president on a star bonus space. There is a space for the Playbook that allows the player to either take a win token or if they have the correct amount of win tokens, they may place a block on the playoffs, championship, finals or bowl game. There is a space for Building or Gaining Materials that allows the player to either gain a construction token for each money token spent or place a block from their supply onto the stadium building board. The player must then pay the building cost for this latter action. It should be noted that a player is only allowed to place 1 block on the stadium board per turn and that they may have only 1 block on a particular building. It should also be noted that the player must have 1 block on the 1st level before building on level 2. They must have 2 blocks on level 2 before building on level 3. There is a space for Ticket Sales that gives the player one million dollar token for each win they have, up to a maximum of 5. If a player has 10 wins, they receive six million dollar tokens. Skyboxes and new stadiums give ticket bonuses. There is a space for Drafting and Trading that allows the player to pay the signing bonus of an available player and place them face up in front of them. Players can gain win tokens and possibly entertainment tokens during the Game Time step. Trading is done by taking a player from their team and swapping it with a player in the draft area. No signing bonuses are required for trades. It should be noted that the player is only allowed to draft or trade one player per vice president on the space per turn. The player is also allowed to trade a player for a victory point token or a five million dollar token in the draft area. There is a space for Sponsorship Sales that rewards the player with 2 million dollar tokens. There is a space for Merchandising that rewards the player with 2 entertainment tokens and one million dollar token. In the fourth step, players will resolve Game Time effects and loss effects for stacked turn tokens. First off for each space on card or building that shows a football, the player gains the token shown. Next, the players must each pay salaries to the supply for their players and employees. They also must pay one million for each vice president. If a player can not pay all the salaries, they will lose any players or employees that they do not pay for. The cards go into a discard pile. If a vice president’s salary isn’t paid, then the player can not use them on the next turn to place them on an Action space. Finally the players must calculate their loss. For each space on the action board that has stacked tokens, each player loses a token, employee or player depending on the action space. For more information on the loss for each space, please check out the rulebook. For the fifth and final step, the player with the Commissioner pawn passes it to the next player in turn order. A new round will then begin. The game continues until either one owner has used all of their blocks to buy buildings and/or win playoff and championship games. When this happens, the player’s complete the current turn before ending the game. 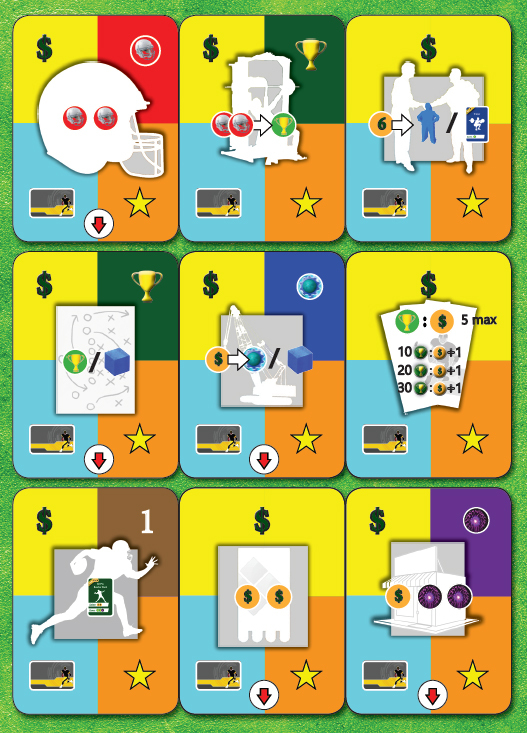 Players will then add up their victory points from cards, buildings and entertainment tokens, as well as bonus tiles and victory point trade tokens. The player with the most victory points is the winner. This game has some cool looking pieces. There’s the Action board which is a little bit difficult to understand to begin with, but with a bit of help from the rulebook it makes more sense. The graphics and thickness of the board is pretty good. The other board is the multi-tiered Stadium Building board. This is actually one of the coolest parts of the game. I can’t recall having seen three boards assembled together like a football stadium. It’s definitely unique and looks awesome when put together. Again, the iconography is a bit rough to begin with but easier to understand after several plays. There are lots of small and large round tokens. There are tokens for building, equipment, win, million, entertainment, bonuses, victory points and the like. Yes, there’s lots of cardboard tokens with this game. Many of the graphics on these match the iconography on the boards. I do say that for the most part, they all look cool. Next there are the plastic pieces; the vice presidents and the player’s colored blocks. The latter are all brightly colored cubes, while the former are custom plastic meeples. I will say that these VP meeples are quite unique and are fun to play with. Of course the best looking piece is the Commissioner pawn that’s shaped like a football trophy. I really love the design for it. Finally, the last pieces of the game are the cards. There are 2 types of cards, the player cards and the employee cards. The same iconography that is found on other components can be found on these cards as well. Each card has a nice shiny finish and is really easy to shuffle. The card has a silhouette of either the player or employee that it represents with their cost and salary on each one. I have to say that I kind of like how these look. If you want to pretend you’re drafting that all star player from your favorite university, you can. There are no distinguishing pictures or anything to keep you from doing that. That’s another aspect of the components that I really like. Overall, I think that the game looks very nice and has some unique pieces that I’ve never seen before. I’m pretty happy with the overall design. The rulebook for this game is pretty much like those of previous Joe Magic games. It has the same type of layouts and design as those. There are several pictures and an example or two in the fairly thin 4 page booklet. Like in the game, Other World, this rulebook tends to jump around a bit and makes things a bit difficult to understand at first. Thankfully the book isn’t that large so it doesn’t cause too much of an actual problem. I will say that I wish that there were more pictures and examples as well as more attention to spacing and details. In many ways, the rules are like a giant run on sentance that can be a bit difficult to read through. I feel like there could have been a better outline of each of the different steps and how the game is won. You basically have to read through the whole thing before you will get it. I also would have like a handy reference on the back of the book to be able to look back at without searching through previous pages. I will say though that there are a few highlighted sections, like the action board and game time. Why were these emphasized and printed in bold bright colors? I have no idea. In any event, the book is a bit of a mess but it gets the job done. While I’m not thrilled with the look or design, it did help me understand how to play the game and isn’t that what a rulebook is supposed to do? I’m hoping that the rulebook for the actual game will be much better. This is a fun game that take the game of football into a different direction. I’ve played games like Blood Bowl and 1st & Goal and have enjoyed them. However this game approaches football in a different way. Where the other games go into the actual game of football, this one goes about the day to day of owning and running a football team. From drafting players to hiring staff. Each round you’ll be doing your best to get your team the best options money can buy. You’ll also be building up your stadium with sky boxes, half time shows, food courts and VIP restaurants. You’ll also be trying to motivate your team into the playoffs, the championship and the bowl game. All this will be in an effort to gain victory points. You’ll be doing all this in a worker placement style way, as you place your Vice Presidents on the board to collect different resources. I have to say that I like the mechanics of the game and how everything starts coming together in those later rounds. It’s actually a pretty well rounded game. While it’s not what you’d expect from a game about football, it’s still pretty good. The iconography can take a bit of getting used to, as I think I’ve mentioned earlier, but with a couple of plays you start getting used to it. Fans of euro style worker placement games may enjoy this one. I also think that if you’re looking to experience what it’s like behind an owner’s desk, than you will most likely enjoy this game. If you’re more interested in mixing it up on the gridiron, then you may be a bit disappointed. As it is, I like the game for what it is and find myself enjoying it. I would recommend giving this one a try. Stadium is a worker placement game where players get to feel what it’s like to be an owner of a pro football team. The play time is pretty average. Most game sessions last a little over an hour. The componets are pretty unique and I like a lot of the different designs. However the iconography takes a couple of play throughs to completely understand. The game itself is quite fun. I like how everything comes together. I especially like the design of the game. It’s definitely a unique take on the football genre. It definitely gives you the feel of being an owner and having to make lots of executive decisions for your team. 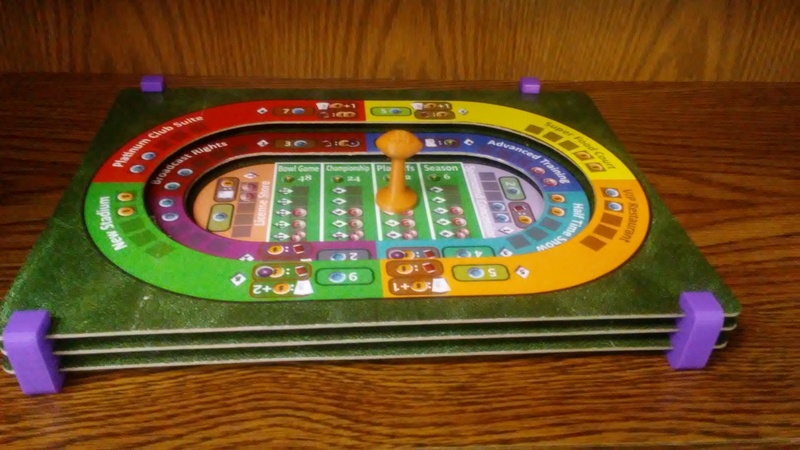 Fans of worker placement games should enjoy this one, especially if they like football. Players that are more interested in the actual game of football and less on the day to day basics of running a team might find this one a bit off for them. As it is, I rather enjoy the game. There are a few things that are a bit rough around the edges for the game but overall it’s pretty solid. I would recommend giving it a try. No need to keep a trainer handy when playing this game. This entry was posted in Preview Reviews and tagged board, board games, card, card games, football, games, hanny, joe, joe magic games, magic, mark, mark hanny, stadium. Bookmark the permalink.